I set up this account initially to assess Jotform for the purpose of transferring my Work forms from Adobe. I am employed by CSA- Username ComplianceChief. I am the Operations Manager of CSA. I am requesting assistance via my personal account because I have been unable to establish contact with Jotform via my work account. I have sent 3-4 maybe 5 Urgent messages to Jotform in the last 8 hours. I started with our work account phudson@csa-afsl.com.au........but was forced to change that at 2.16pm to alerts@csa-afsl.com.au. We have not been receiving any email notifications to phudson....you can view our history for further information. We had an email outage Thursday 10th - Sunday 13th. 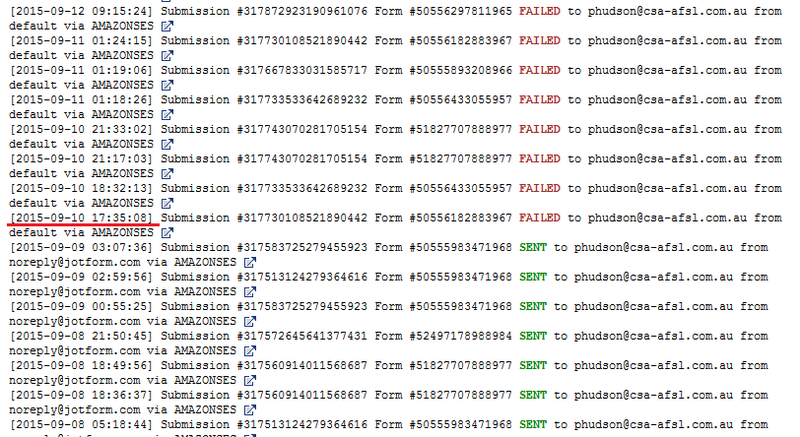 Now it appears that all emails to phudson & other email addresses simply do not work. It is essential to our business that these email notifications work every minute every day every week. Now we don't seem to be able to communicate with you....Jotform!!!!! I soooooo hope you simply are unaware of these problems for whatever reasons....it was my belief your support was 24/7????? First of all, sorry this issue has happened to you. I checked the mail log and you are right, "phudson@csa-afsl.com.au" emaill address has not received any mail since 2015-09-10. Also, I checked the bounce list for that email address, it is not in the list. Alternatively, you can use the SMTP method to send your emails with using your server, so you can beat that problem completely. To do that, please follow the instructions from How to Setup SMTP for a form page. If anything stays blurry, please let us know. Am I correct in assuming you have not received any messages today from phudson etc? Apart from the above advice how can I re=establish phudson etc as an email notification? Right now I need the most efficient & quickest way to fix this. I set these forms up months ago and have had no problems receiving email notification. Which would be the best option from the above or do I need to do both. To overcome this situation, you have two option as I mentioned above. Whitelisting means the use of anti-spam filtering software to allow only specified e-mail addresses to get through. To do that, you need to communicate with your server administrator. Ask them to whitelist our addresses. The other one is using SMTP. This option allows you to use your own server, so you never encounter anything like that in the future, if you use your own server to send email. You can do that by using How to Setup SMTP for a form page tutorial. Please try these solutions to overcome these situation. Both of them are easy to apply, but SMTP solution is the more efficient one. Because emails are going to send through your servers, so you can easily react any upcoming problem.